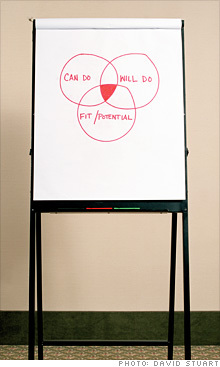 Fortune Small Business's makeover experts visit a human-resources consulting firm seeking a smarter growth strategy. 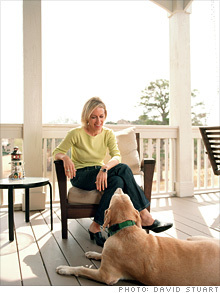 Dearth and family pet Willow at home in Atlanta. ATLANTA (FORTUNE Small Business) -- Sales have doubled. Profit margins are twice the industry average. Costs are low. And a new division has rapidly taken root. So why is the owner of ISHR Group, an Atlanta human resources consultancy, losing sleep? "Frankly, I'm winging it," says CEO Monique Dearth, a former General Electric (GE, Fortune 500) human resources specialist. The firm's fast growth has left Dearth scrambling to manage its finances and scarily dependent on a few large clients. And the Web site needs an overhaul. ISHR's customers include Coca-Cola (KO, Fortune 500), DuPont (DFT), and GE. It helps them screen job candidates, assess employees, and train managers to deal with such issues as sexual harassment and workplace diversity. Sales in 2007 were $1.2 million, up from $622,000 in the previous year. Dearth and many of ISHR's consultants have worked for GE, which is viewed as a leader in human resources practices, and the firm has capitalized on that. A staffing division that launched last year, HR OptIn, provides clients with permanent and temporary HR professionals. After just nine months in business, HR OptIn accounts for one-third of sales. Dearth, who works from her Atlanta home, has achieved this growth using a network of some 30 contract HR professionals - most of them mothers eager for flexible, part-time opportunities to work remotely. The one staff employee, Shari Johnson, 40, heads HR OptIn. This year Dearth, who retains 80% ownership of ISHR, sold stakes in the firm to Ellen Dotts, 45, and Stacy Sollenberger, 38. They handle leadership seminars and assessments. Both had previously worked as ISHR consultants. Dearth, 39, says the new arrangement allows Dotts and Sollenberger to take greater control of their specialties, giving her more time - though perhaps not enough - to focus on management. In a few months Dearth, who has two young children, will move her family to Denver. Her husband just took a high-pressure job as a restaurant chain executive in that city. Because she works from home and has clients across the U.S., she sees the move as a "minor blip." Still, she worries about managing a fast-growing firm while her children are young and her husband pursues a demanding career. Though Dearth hopes for double-digit growth in 2008, she also fears it. Her marketing and sales efforts are more sporadic than strategic, and her firm's lopsided growth reflects that weakness. She knows her financial acumen is limited, and she could also use some help with ISHR's website, which is about one-third of the way through a redesign. In search of a plan, Dearth appealed to FSB. We tapped three veteran business strategists to help her out. 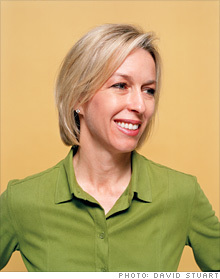 Rosalind Resnick, 48, owns Double R Ventures, a New York City consulting firm for entrepreneurs. Elaine Eisenman, 59, is dean of executive education at Babson College in Wellesley, Mass., and a former HR executive with American Express (AXP, Fortune 500). Mary Madden, who is in her 60s, is a principal in the Atlanta management consultancy Grisanti Galef & Goldress. Dearth arrives an hour early for the meeting at an Atlanta hotel conference room. Resnick opens the conversation by giving the CEO a pat on the back. "Right now, you're running a highly profitable company," she notes after a quick analysis of ISHR's finances. "Most staffing and HR consulting companies are labor-intensive ventures that struggle to make a profit. I approve of the home office to keep overhead low." Then the grilling begins. Who are ISHR's most profitable clients? Which segment is most likely to generate the most growth - and what strains might that put on the firm's infrastructure? Dearth admits to a serious lack of financial savvy. She describes her business plan, based mostly on contracts booked by existing clients, as "very conservative." She hasn't factored in growth or its likely impact on ISHR. And her accounting, budgeting, and planning systems need major attention. "Getting a handle on the financial aspect of the business is this year's goal," she says. Talk back: What's your advice for ISHR? Madden tells Dearth to hire a part-time CFO. ISHR is too small to require a full-timer. But retaining someone to review the firm's finances weekly, or even biweekly, would be valuable. Be careful in assessing candidates, Resnick warns. "CPAs and accountants are trained to look at your financial history, but you need someone who can envision the future and ask, 'What if?'" Resnick adds a crucial caveat: "Hiring a CFO won't relieve you of overall financial responsibility for your company. As CEO, you must understand the numbers." Next on the agenda is the firm's marketing and sales strategy - or lack thereof. "We don't do any formal marketing," Dearth says. "Most of our clients hear of us through word of mouth." Eisenman pounces. "So you aggressively wait for the phone to ring," she says tartly. Word of mouth can be a powerful form of marketing. But, notes Eisenman, growth by referrals alone is a haphazard way to build a business. Eisenman asks whether ISHR's client base is diversified. Dearth concedes that while the staffing segment's is, two big corporations make up nearly 80% of her sales on the consulting side. To win new clients, Eisenman advises face-to-face meetings. "You get only 20 minutes on the phone - at most," she says. "In person, you have more time and can build a relationship." Eisenman abruptly shifts gears. "Monique, I got agitated reading your website!" she exclaims. First off, many staff bios are "too cute," she says. (WenLyn is an "avid quilter.") Eisenman is also troubled by the many references to Dearth's former employer, GE. "It tells potential clients that you're a bunch of young moms selling GE-style HR - when you're not baking brownies for the church fair." Dearth asks what her site lacks. "Success stories!" Eisenman snaps. "Highlight how your work has added value for at least three globally known clients." Madden tells Dearth to test the new site on a group of HR executives. "Try it out on some men," she adds. Two weeks after the Makeover, Dearth has made major strides. She found a part-time CFO by tapping her network of female professionals. After canvassing HR colleagues nationwide about her Web site, she is about to launch the new one. As the experts advised, Dearth rewrote some bios and limited GE references. "But we didn't sanitize the site," she says. "The firm's personality is still evident." We'll keep you posted on Dearth's progress. What's your advice about the issues facing ISHR Group? Tell us in our discussion forum.